I started reading the book, and I was enjoying it, and then I was overcome with serious pangs of guilt because I still have a few titles remaining on my assigned reading list. So I stopped and moped for awhile. Then I had this genius idea to listen instead of read because none of my assigned titles are on audiobook! That's not cheating, right? 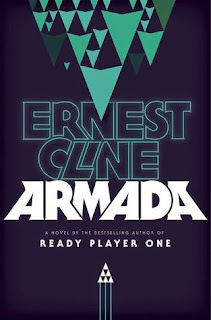 I'm pretty sure that was the better choice anyway, because Ernest Cline's Armada is read by Wil Wheaton, and boy do I love me some Wil Wheaton. This isn't a new story. In fact, it's an almost overdone story. Boy loves video games. Boy sees aliens. Boy realizes all of his video game playing has really been in preparation for the very day the aliens attack. Nope. Not a new story. But the cool thing about Cline is that he knows this too. He acknowledges it, embraces it, and totally geeks out over all the stories with similar plots that he grew up loving. I mean, come on! The number of The Last Straighter references is staggering, but I have no problem hearing a guy gush over Alex Rogan. While not as awesome as Ready Player One...actually, they're on two completely different levels...I still thoroughly enjoyed Cline's follow up novel. With each reference I understood, I did a little happy dance. And that's really what I wanted. I wanted to remember, and I wanted to get lost in a story written by someone who loves to remember as well. There are plot holes and predictabilities, it was cheesy at times and lacking in character development, but overall it was a satisfying story. Cline is the uberfan's author, and and this uberfan is waiting anxiously for his next novel. Sidenote: At times Wil Wheaton sounds just like Tim Allen...and that is awesome.